French pupils as young as five will be taught to use Twitter this academic year, when the popular social network reaches into classrooms across the country as a reading and writing exercise that is bound to get tongues wagging. As throngs of miserable little faces file through school gates across France this week after a once seemingly endless summer break, at least some of them have something exciting to look forward to. Twitter. 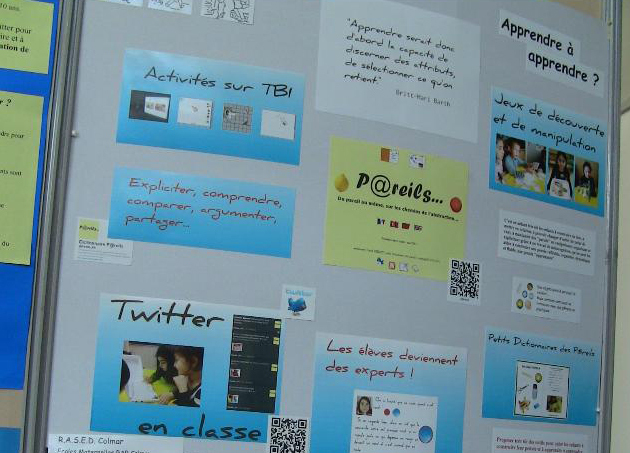 This academic year will see more teachers than ever in France incorporating the popular social network into their curriculum. There are now more than 50 'Twittclasses' registered in schools across the country, for pupils aged from five and upwards. Employed as an exercise in reading and writing, tweets must be perfectly constructed and spelt; each and every one checked by a teacher before eager fingers are allowed to hit 'Tweet'. Twitter instructions on a school board @TiceChampagnole. 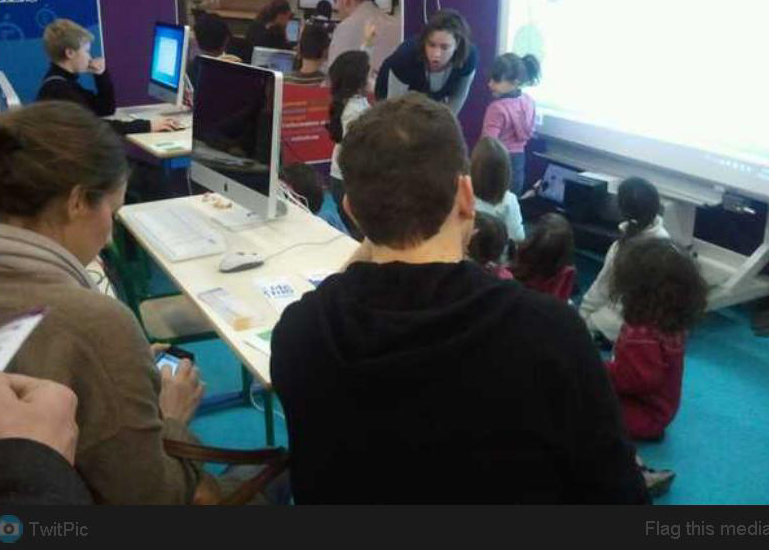 Primary school teacher Jean-Roch Masson, whose Dunkirk class of six to seven-year-olds was one of the first in France to start tweeting last year, told French radio Europe1 Monday that each tweet posted by his class goes through a thorough editorial process comprising writers, copy-editors and online tools such as Google Docs and Tumblr. Their twitterfeeds are, unsurprisingly, a tedious read to anyone over the age of 10 (although the same can be said for many adult Twitter users). “On Sunday, my sister had her communion. It was really good,” reads one from Nathan. “We’re celebrating Lou and Jessie’s birthday. Their mums have made cakes that look like chessboards!” from another. Salim adds that “we were talking about pandas yesterday”. You get the idea. With children as young as five employed into the scheme, parents have, inevitably, voiced concerns over the vulnerability of their panda-musing little ones on an adult social network. Many schools have efficiently addressed this problem by making their Twitter feeds private (this one for example). Mr Masson meanwhile has indoctrinated his pupils so well that they are tweeting the rules. “With Twitter, we learn to be polite, we choose a nice avatar, we don’t give our address out,” reads one of their daily declarations. Twitter as an educational tool has clearly got these children talking about stuff their teachers want them to. It also allows their parents to track some of their daily activities in class and on school trips: something few parents would oppose. And besides, a head start when it comes to the responsible use of social networks and online tools such as Google Docs and Tumblr, is no bad thing. It looks like France’s next generation is going to be way ahead when it comes to social media. We should all take note. Thumbnail image courtesy of Flickr user The Daring Librarian under the Creative Commons license. Ha ha - I love the paragraph with the examples of their tweets! Five years old is certainly extremely young to start with Twitter. But I guess it’s a fun and exciting way for them to learn how to read and write. That is a very interesting approach on to incorporate learning and safely communicating via social networking. Many classes in America don't allow this due to it being either too distracting or because so many kids in America have learned to beat the system and in some cases hack into other people's accounts. This has to the potential to become a very useful aspect in today's society, however, it could also become a great menace, so one must take heed and go about this approach carefully and update it as often as its needed or warranted.